Every year, I try to fish the Cumberland Plateau smallmouth bass streams a handful of times. The opportunities have decreased the last couple of years since the best summer smallmouth fishing coincides with my busiest guide season. However, I still sneak out at least a couple of days a year. This year, the first trip just happened to be Memorial Day. I kept the holiday weekend open on my guide calendar so I could spend time with friends and family. This worked out perfectly as my wife was able to join me along with Mark Brown from Chota Outdoor Gear and my buddy Jayson who is a smallmouth fanatic as well. We hit a favorite section of a favorite stream, one that we hoped wouldn't be too crowded on this holiday. Turns out that we picked correctly. Over the course of the day, the only people we saw were just a few people swimming in the old swimming how at the parking area. The rest of the time we had it to ourselves. Four different things really stand out in my memory of that day. First was a nice bass I caught on my first cast. I was wading up through the stream along one bank with my wife Leah. We had passed Mark who was working the tailout of a large pool. I glanced down and saw this bass charging me to investigate the commotion my wading was making. 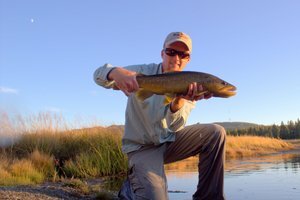 I quickly grabbed the fly and pitched it a few feet out towards the fish. It turned, glided over, and sucked it in without any hesitation. Sight fishing is my favorite thing to do so that made my day. It wasn't the coolest part of the trip, though. The next memorable thing was another sight fishing opportunity. Again, my wife and I were wading along the bank. This time we were passing Jayson as he worked the middle of this large pool. Again, another fish came charging over to see what the commotion was all about. This time it was a smallmouth bass. I know that the fish would probably spook if I moved much at all, so I called to Jayson and told him to cast up towards me. The exchange went something like this. "Jayson! There is a nice smallmouth almost at my feet. Can you see it? He confirmed that he couldn't. Thankfully my rod was already pointing that general direction so I moved the tip just a bit. "The fish is right where I'm pointing my rod, about 5 feet out. Hurry and cast or it will move on." Jayson started casting and dropped the fly just beyond the fish. It was cruising down the shoreline in his direction and didn't see the fly land. "Strip it hard! 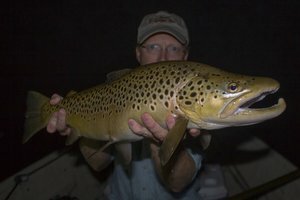 You need to get the fish's attention." He made a hard pull on the line and the fly made a satisfying chug while leaving a solid bubble trail. The fish immediately turned. All the while, Leah and I were watching this take place nearly at our feet. "Okay, the fish turned. He is approaching your fly. Twitch it just barely. There! Get ready....SET!!!" You can't make this stuff up. It wasn't a huge fish by any means, but talk about a satisfying piece of teamwork. It was one of the better smallies of the day. This is why I love guiding. 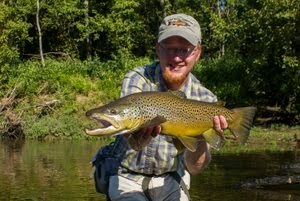 Spotting fish for clients and seeing them make a good cast and catching a fish is incredibly rewarding. The smiles on people's faces are better than catching the fish myself. Leah and I continued on up the river. Eventually we all reached the highest point we wanted to fish before turning around. Here we stopped for lunch while a light shower cooled things down. About this time, something strange happened. I smelled smoke. Not a campfire, but tobacco smoke like a pipe or cigar perhaps. I knew that none of our group was smoking. Then I remembered seeing some fresh tracks on the stream banks. When I asked Mark, he said that he and Jayson had noticed the tracks as well. Apparently we had a neighbor in the vicinity. The strange part about this is that we were in a really remote area by this point. Knowing that many of these streams have a problem with pot growers, I was hesitant to go any further up the river. The last thing we needed to do was to run into a grow operation and get shot. 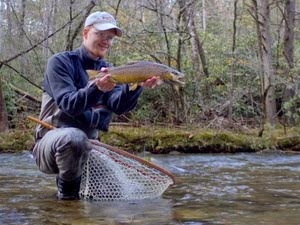 This is always a concern when fishing these remote rivers and streams and a good reason to not go alone. We turned around and started fishing back down the river. When we got back to the pool where Jayson caught the bass while Leah and I watched, we decided to fish again. I was in the middle of casting when Leah suddenly said, with a bit of urgency I might add, "There's a bear, THERE'S A BEAR!!!" The first bear that we have spotted here on the Plateau quickly disappeared. I know they are around and have seen bear sign, but it was really cool to have one drop out of the woods while we were fishing. Leah's day was made at this point, but one last memorable moment was yet to occur. The streams here on the Plateau require many crossings back and forth depending on where you can safely move along the banks and around the deep holes. Right at the parking lot, we crossed back over to where our vehicles were parked and started up the bank. Suddenly I heard Jayson say "Copperhead!!!" rather loudly. Sure enough, the first copperhead of the year was underfoot and Jayson had almost nailed it. Thankfully he didn't or else he probably would have been the one getting nailed. This trip was a perfect example of how intriguing these streams are with a healthy dose of danger mixed in for good measure. We had a good time, caught some smallmouth bass among other things, saw a bear, a snake, and had a close encounter with some mysterious person. The wildflowers were also fantastic. Fishing the smallmouth bass streams of the Cumberland Plateau never disappoint and this trip was no different. 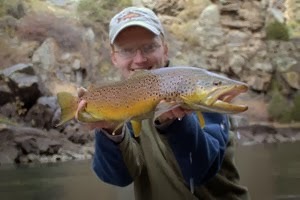 If you are looking for remote fishing, these streams offer endless possibilities to explore.